In June, I went to New Orleans for two reasons: 1) a work conference and 2) to check out Tulane School of Public Health. Tulane has been my number one choice in graduate schools for some time so I jumped at the chance to go for a work conference. Tulane has the exact PhD program that I want and numerous professors that conduct research in public health areas that I’m interested in (since I’ll be studying that subject for 4-5 years!). When talking with one of the professors, he asked me how I liked New Orleans. I told him that I hadn’t seen much of it yet because of my conference. He told me that it was a city that I’d either hate or love. There is no real in-between. Good thing because I absolutely fell head over heels for this city that I hope to call home in a few years. New Orleans is a city of deep history and culture. Everywhere you walk, you’ll see it on the streets. However, the area you’ll see it the most is in the French Quarter. 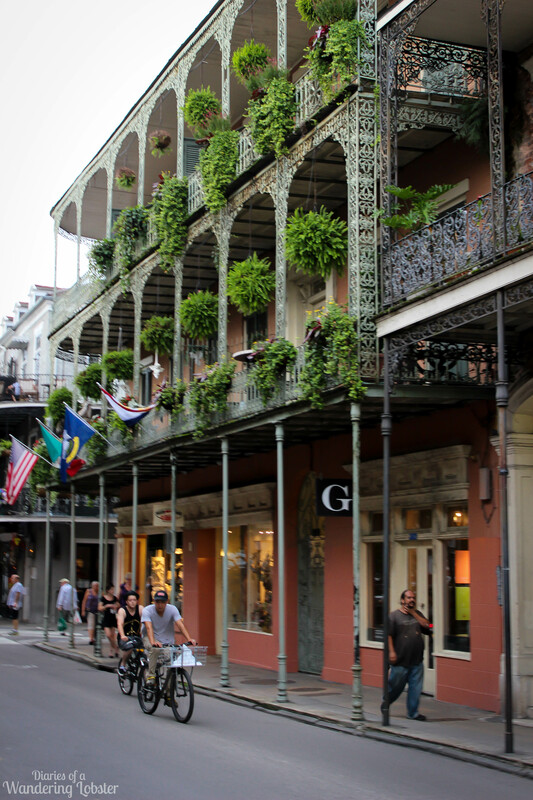 The French Quarter, or Vieux Carre, is the oldest neighborhood in the city founded in 1718. “The Quarter” is designated as a National Historic Landmark and suffered relatively light damaged from Hurricane Katrina in 2005 due to its distance from the levee. The French Quarter is bordered by the Mississippi River from Canal Street to Esplanade Avenue and inland to North Rampart Street for a total of 78 street blocks. Many of the current building date back to the late 1700s and early 1800s when the United States purchased New Orleans in the Louisiana Purchase. The architecture of The Quarter reflects Spanish colonial architecture because most homes were built during Spanish occupation of the city. The original French architecture was destroyed during the Great New Orleans Fire of 1788 and another great fire in 1794. Since the 1920s the historic buildings have been protected by law and cannot be demolished and renovations must be approved by the city. One of the main attractions in the French Quarter is Jackson Square. Jackson Square is a one-square public gated park designed by architect and landscaper Louis H. Pilie. It was originally names Place d’Armes, but renamed after General Andrew Jackson (who would later become President) after the 1815 Battle of New Orleans. City leaders purchased the equestrian statue of Jackson in 1856. Opposite the small park is St. Louis Cathedral. To the left of the cathedral is The Cabildo, the old city hall, now a museum where the Louisiana Purchase was signed. To the right of the cathedral is The Presbytere, which originally housed the Catholic priests, but later became the courthouse in the early 1800s. Cafe Beignets – not quite Cafe du Monde, but equally yummy! Nearby Jackson Square is Cafe du Monde, where you can purchase beignets and cafe au lait 24 hours a day except for Christmas! If you’ve never had beignets then it’s a must hit spot to feed your sugar tooth. Beignets is a French term for a pastry made from deep-fried choux paste topped off with powdered sugar. 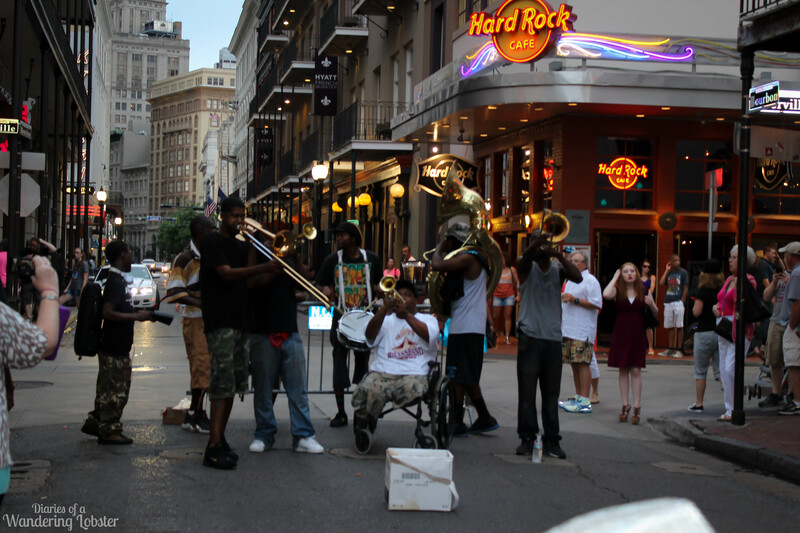 Perhaps the most famous landmark in the French Quarter is Bourdon Street or Rue Bourdon. Bourdon Street extends 13 blocks from Canal Street to Esplanade Avenue. It is primarily known for its bars and strip clubs, especially during Mardi Gras. Walking down Bourdon Street will stimulate all your senses. Local musicians will hang out in the streets playing amazing jazz for a few dollars from the tourists. You’ll see barely clothed strippers hanging out in the doorways trying to attract the attention of some drunken men. Numerous tourists are sipping hurricanes while walking down the street to the next bar. The French Quarter has an open container law so it’s not uncommon to see drunk folks stumbling down the street with a giant hurricane in their hands. There are several restaurants located on Bourdon Street and many delicious restaurants throughout the French Quarter serving traditional Creole, Cajun, and anything in between. While I was in New Orleans I tried everything from the local fish, Beignets, to turtle soup. You can’t really go wrong with all the good food around! Just walking around the French Quarter is like walking back in history. I’m a huge fan of the architecture of the Quarter. It reminds me of the Caribbean meets Europe. As an avid traveler I enjoyed the mix of architecture styles and the culture. Around every street corner is a local musician, artist or fortune-teller. The art galleries are prevalent and full of local artists’ work. The cobblestone streets have hanging plants draping off the iron-rod balcony fences and old-fashion gas-lit lanterns light your path. Do you want your palm read? Thousands of tourists flock to New Orleans every year to enjoy its history, architecture, music, and good food and drink. Whether you are sucking down hurricanes left and right during Mardi Gras or eating your way through all the Creole and Cajun dishes in New Orleans, the French Quarter cannot be missed. It is truly the heart of New Orleans. Have you been to New Orleans? What do you think of the French Quarter?